Review of the Pentax K-S2: Is it Worth Your Money? A wide range of cameras exist on the market today, boasting different lens sizes, screens, controls and of course, that look that you love. In a world dominated by social media and image sharing, it is important to have a trusted camera that not only captures and freezes moments in time but also does so to perfection. There is a variety to choose from, but how to make that choice comes down to your personal preference. And the story you want your pictures to tell. No camera will have everything that will make it the ultimate choice, but in a world where the choices seem endless, it is necessary to sift through a few to make sure that you find a camera that works for you. Whether it is the semi-professional, the student or the social media star in the making, the Pentax K-S2 offers a range of features that will make your images say more than you ever could. Its new design, added features, and upgrades from its predecessors, will give you that warm feeling, which confirms that you made the right choice. This article will examine some of the Pentax K-S2 camera features updates, and inform you of why it might be worth your time and money. This camera is an upgrade from its predecessor the Pentax K-S1. It was released in February 2015, which was only five months after the K-S1 hit the market in 2014. Although having fewer options regarding the body color, the K-S2 knocked its predecessor out of the water with its added features. It came on the market with a weather sealing body. And it had Wi-Fi capabilities. These features were absent in the former model. They share the same basic features, except that the K-S2 also has a 3” fully articulated screen, versus the fixed-type screen in the KS1. It is also selfie friendly for those who wish to capture themselves without the awkward positioning of the hands or asking a nearby stranger for assistance. K-S1’s ability to pair easily with smart phones for ease of access and easy sharing, as well as its remote-control access leaves reassures us that it is a good camera to have. The new and improved Pentax K-S2 is not your old run-of-the-mill camera. It is a premium device in the DSLR category, boasting a fold out articulated screen, which makes it first in its class. It also has a new standard zoom that makes it a lot easier to capture images at great distances. And it does so without losing the untouched effect. Capturing images in motion is also a breeze with this handy camera and that makes it a must have for the outdoor enthusiast. Despite it being more compact, you do not have to worry about losing your grip. It is sturdy in the hand. Because of its ergonomic design makes for a device that is easy to handle. Despite several new features, the K-S2 carries over the K-S1’s conventional mode dial, giving the user ease of access for choosing different ways of capturing images or making videos. The Pentax K-S2 shares most of its key specifications with the K-S1 except for the articulated screen on the K-S2, the Wi-Fi connectivity capability and its weather-sealed body, which is also slightly larger. The weight might also be a drawback for persons who wish to peddle the camera on long outings. The K-S2, though not sporting everything that is required by all photographers, did manage to retain some of its best features while compensating for others. However, the articulating screen makes it more convenient to capture photos by repositioning the camera at different angles. The KS1 has a fixed screen that limited the photographer’s ability to capture wide range photos. And this camera model’s environmental sealing feature allows for withstanding weather changes. So moisture will not prohibit or compromise images when taken. This makes for a great camera for the high adrenaline risk takers, who want to chase a tornado or shoot photos in the rain. Also, you do not have to worry about your videos sounding choppy. The new model has an enhanced audio recording option that is made possible with its new microphone port. In addition, you can snap a photo of yourself with its selfie friendly LCD, and then pair the camera with your smart phone using the NFC connection that is made available before uploading or sharing in the cloud. It also has time lapse recording, so you do not always have to stand behind the camera. Just position it in a convenient place and join the fun. Other cameras in its class possess many of the same features, such as the Pentax K70, the Nikon D5500 and the Canon SL2. The main specifications are shared. However, the K-S2, with its weather resistant casing and high sensitivity ISO range extending to 51,200 naturally makes it a camera that is essentially a cut above the rest. The Pentax K-S2 has a selling price of approximately $629.95, which excludes kit options. Pentax is renowned for its ease of handling, and in this department, the K-S2 does not fail. It fits in the hands perfectly with its ergonomic design, making it fun to work with. The controls are also very smooth so it is a lot easier to navigate quickly, especially when under pressure to capture multiple photos in single burst speeds. The retractable lens that comes with the Pentax K-S2 makes it easier to walk around with as it compensates for the extra bulk. It has a plastic lens that is without a lens hood. But it still permits for Quick Shift functioning. This means you can alter between AF and MF mode without interruption. However, extending the lens before taking a picture may not always work in your favor. This is so especially in those moments when you want to capture a fast moving object. What this also means is that, in the event that you want to take multiple or quick shots, it is best to leave the lens extended. Though easy to handle, competitors in the K-S2 category can boast a deeper grip that makes for easier handling. However, its ergonomic design is an added benefit. The Pentax K-S2 comes with the Pentax DLI109 lithium battery pack that facilitates the capture of 480 images before it needs to be recharged. At 50 percent, it is capable of taking upwards of 410 pictures. However, this number can be greatly diminished if other functions are being utilized at the same time, or before images are captured. The lithium pack, nonetheless, is far more convenient for on the go usage compared to AA batteries. The quality of the images you will take with the Pentax K-S2 might make you delighted with your purchase. The vibrant colors are displayed on the flush or extended screen, which can easily be manipulated to taste. Images, if not ideal in their raw state, can be sharpened, or further adjusted, using varying customization tools. There are many options, which you experiment with when editing your photographs. A picture taken using one setting, such as standard, can then be adjusted to reflect Radiant, Bright or Vibrant, picture settings. Feel free to be creative and utilize such image options as Bleach Bypass Monochrome, Reversal Film or any of the other creative choices afforded by the K-S2. Raw pictures do not have to be discarded if they need editing. They can be stored on the device and later modified. Usually, images captured in the daytime will naturally give the best results, or even those on a cloudy day. However, images taken in the shade tend to come out with a purplish hue, much like most other brands of cameras. These images can be later rectified using the Shade preset customization feature. JPEG shooters are offered a myriad of scene modes and digital filters. The photo output is usually excellent. Raw images can be saved using the PEF and DNG formats. You can also opt for Invert Color and Toy Camera digital filters. Someone with a highly creative mind will be most appreciative of these settings as they are more intense than their counterparts in terms of customization. Although video making was not the main asset for the K-S2, its performance has improved over time. The built-in stereo microphone allows for 25 minutes of capture with a 4GB capacity. We find that this is usually the case if the camera’s core temperature remains stable for long enough. Also, the digital filters are usable in movie mode, which can be accessed using the on/off switch for greater convenience. With a natural ISO of 200 to 51,200 and which can be further be increased to 100, you would expect the K-S2 to offer greater noise reduction with such heightened sensitivity. The K-S2 has superb noise control extending to ISO 1600. Above ISO 6400, sharpness however begins to suffer as noise creeps in at the higher levels of sensitivity. The image soothing capabilities, however, compensates for additional noise, ensuring that the shot quality is preserved. This camera model has many good features and perks. The semi-professional, student or novice can easily manipulate this device to create notable image outputs. Other cameras in its class might have additional features that outweigh some of the features of the K-S2. However, if you want a camera you can get creative with in photo and video mode, in sunshine or rain, then this camera is a perfect fit. Its affordability is also a plus for a camera that does all that it claims to do. There are available items on Amazon for purchase, starting at $625. Shooting images in the rain or other harsh weather conditions have been made easier by the Pentax K-S2 camera casing. You can comfortably take images as you would on a calm sunny day without worrying about damaging the interior of the camera, which makes it even more appealing. When compared to other devices like the Nikon or Canon, the Pentax K-S2 is much easier to manage and store. Its retractable lenses make it easier to handle and not as bulky to walk around with. Fail-safe mechanisms are enabled that warn about the camera being usable when lens is retracted. It is highly recommended though that the lens be left un-retracted in the event off needing to take multiple, quick images or ad-hoc shots. The Pentax K-S2 20MP Wi-Fi Enabled Weatherized WR DSLR with 18-50mm and 50-200mm Double Lens Kit has a natural ergonomic design that is gentle to the touch. Button placements on either side also make for added convenience, especially for a right-handed person. The ability to shoot images at varying angles using the articulating screen adds to the appeal of the K-S2. Photographers will no longer need to shoot from odd angles or awkward positions to get that perfect picture. As with all modern technological devices, this camera has NFC capability, which makes it easy to pair with any smart phone. The Wi-Fi set up and management is easy. And with an app that is downloadable, it is even more convenient to access your camera remotely from your phone. This is a handy feature in the event that you want to transfer data or upload to the internet. Despite its drawbacks, you will not lose by using the Pentax K-S2 20MP Wi-Fi Enabled Weatherized WR DSLR. By and large, the camera is user-friendly. We rate it a 4.25/5 overall. Its high sensitivity, new lenses, articulating screen, and weather resistant casing makes it a truly remarkable device to have. It allows the user to capture images in high and low lights. And if you are in drastic weather conditions, then that is fine too. You will not be losing any image vividness. 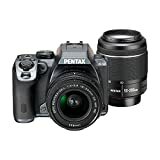 Professional photographers can use this reliable Pentax camera. Someone who is a creative photography genius will find that he has many features available with which to experiment. The customization modes can also easily make you a budding artist. This camera features a retractable lens and built with a slim design that makes it easier to carry. It also has Custom Image setting, to experiment with the color.